Anyone else over indulge the past couple of months? Turkey, dressing, ham, potatoes, cookies and pie. SO much good food. I feel like we need to hit the reset button in January and get back on track. 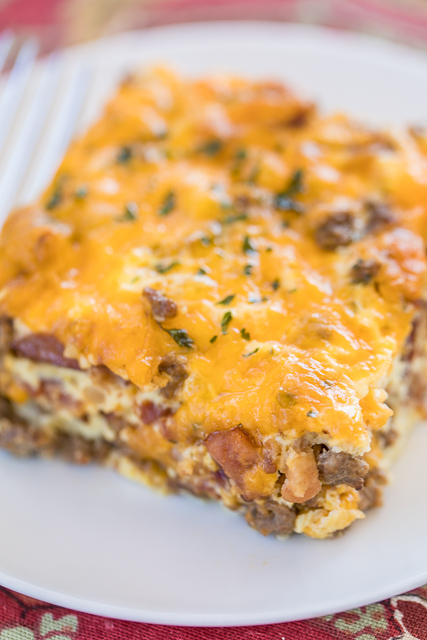 Today I am sharing a delicious Low-Carb Bacon Cheeseburger Casserole. Hamburger, bacon, cheese, seasonings and eggs. It is like a crustless quiche. 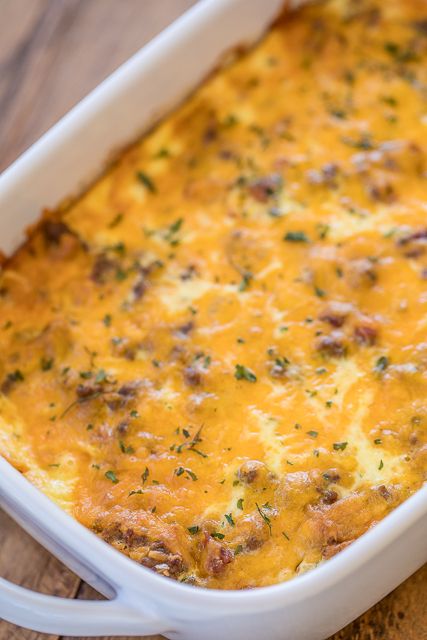 We love quiche in our house, so I knew this would be a winner! When I hear low-carb, I usually think low taste. 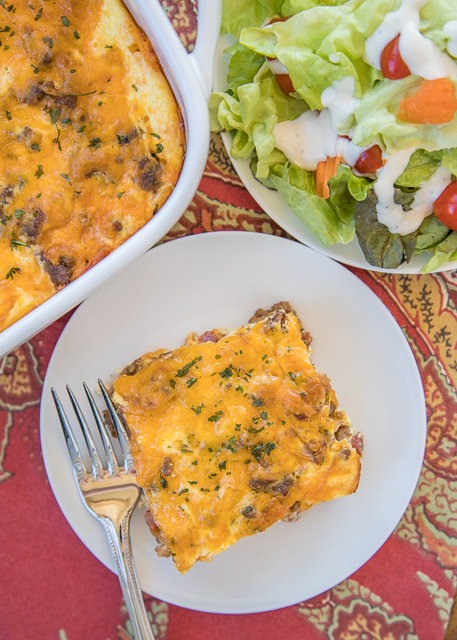 Well, this Low-Carb Bacon Cheeseburger Casserole is low on carbs, but high on taste. To keep the carbs extra low, look for a low-sugar ketchup. There are only two tablespoons of ketchup in the whole casserole, but low-sugar ketchup is good to have on hand for everyday use. We ate this for lunch and leftover for dinner the same night. It was really, really good. We loved the all the flavors! We also loved that it was ready to eat in about 30 minutes! I know a lot of you like make-ahead and freezer meals. 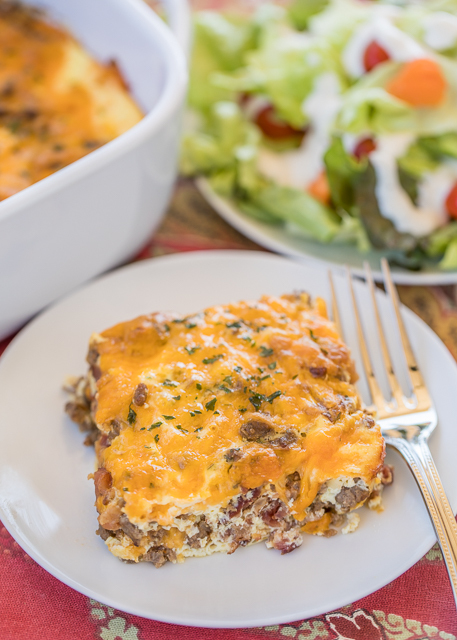 This Low-Carb Bacon Cheeseburger Casserole can be frozen unbaked or baked for a quick meal later. 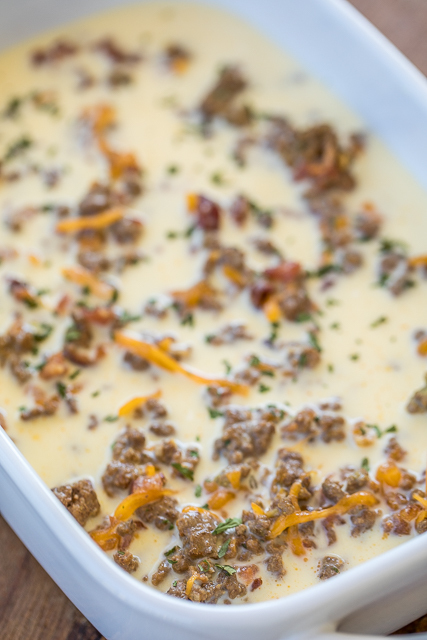 If you freeze it unbaked, thaw it in the refrigerator overnight before baking. I just pop it in the fridge before I go to bed and it is ready to bake for dinner the next day. Preheat oven to 350ºF. Lightly spray an 8x8-inch or 11x7-inch pan with cooking spray. Cook ground beef in skillet over medium heat until no longer pink. Drain fat. 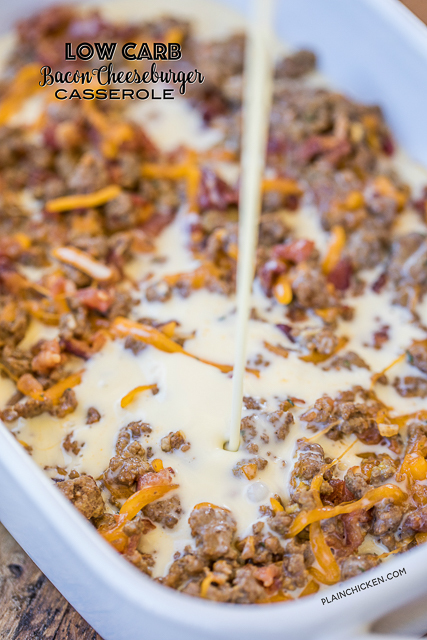 Combine cooked beef, cooked bacon, ketchup, mustard, onion flakes and Ranch mix. Spread in bottom of prepared pan. Top with shredded cheese. Whisk together eggs, milk and sour cream. Pour on top of beef mixture. Bake, uncovered, for 30 to 35 minutes. Can you omit the eggs? Can you substitute the milk for almond milk or even heavy cream? I would like to cut the carbs a little more. Thank you! You can certainly give it a try! Can you use "real bacon pieces?" OMG! I think. Found dinner for tomorrow night. I made this tonight and it was stupendous. I need to make 2 though. For seconds and freezer leftovers. Can i double this for a 9x13 pan? This was too funny. I made this dish last night and one of my college age children put some in a flour tortilla and added salsa like a breakfast buritto. The other one put a slab in a hamburger bun. I tried to tell them that the whole point was be LOW CARB! Using ground chicken works great! This was amazing! Hubby is on Keto and usually on Sundays, we try one new recipe a week for his lunch. I didn't have low-sugar ketchup so I substituted tomato sauce with a little splenda in it. I also used 1/4 cup diced onion instead of the onion flakes. Fantastic recipe!! Great! It's in the oven now! If you make this in advance to put in the fridge or freezer do you go ahead and bake it and then just warm it up? Made this tonight for dinner. My husband loved it. I made it in a 9x13 pan but it was a little on the runny side. So I put it back in the oven for 15 minutes. I also added mushrooms I cooked them first then added them into the meats. I know this a weird question, but do we know how many calories in a serving or anything along this lines? Doesn't have to be exact. Counting calories but this looks so good. Thank you. Made this for supper tonight and it was really good. My love even had seconds (which confirmed he liked it). I would love to know the calorie count. I wish I had calculated it while I was cooking. Not a ketchup fan... does it really adversely affect the outcome to omit it?